Such an inviting fireplace to cuddle by! The Falls is located on the 2 Mile Marker of the lake. It offers one of the best locations at the lake! 2nd floor, elevator available. Non-Smoking. Queen size bed in the master, full and twin bed in the second bedroom, King bed in the third bedroom, and a twin and a queen in the fourth bedroom. 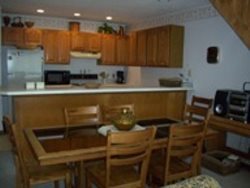 Includes microwave, dishwasher, washer/dryer, wood burning fireplace, 4 TVs, a DVD player, and a gas grill on the lakeside balcony. Complex offers two outdoor pools, docks, tennis courts, and a playground. Very friendly and accommodating. Thanks for everything.